For the American rock band, see Abe Vigoda (band). 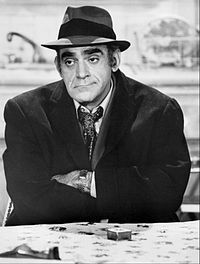 Abraham Charles Vigoda (/vɪˈɡoʊdə/; February 24, 1921 – January 26, 2016) was an American actor best known for his portrayals of Salvatore Tessio in The Godfather (1972) and Phil Fish in Barney Miller (1975–1977, 1982) and Fish (1977–1978). Woodland Park, New Jersey, U.S.
Beth David Cemetery, Elmont, New York, U.S.
Vigoda was born in Brooklyn, New York, on February 24, 1921, the son of Samuel and Lena Vigoda (née Moses), Jewish immigrants from Russia. His father was a tailor who had two other sons: Hy and Bill. The latter was a comic book artist who drew for the Archie Comics franchise and others in the 1940s. Vigoda began acting while in his teens, working with the American Theatre Wing. His career as a professional actor began in 1947. He gained acting notability in the 1960s with his work in Broadway productions, including Marat/Sade (1967), portraying Mad Animal, The Man in the Glass Booth (1968), portraying Landau, Inquest (1970), and Tough to Get Help (1972). His best known film role is that of Salvatore Tessio in The Godfather (1972). He also appeared briefly in The Godfather Part II in a flashback sequence at the end of the film. According to Francis Ford Coppola's commentary on the DVD's widescreen edition, Vigoda landed the role of Tessio in an "open call", in which actors who did not have agents could come in for an audition. While living in Los Angeles, I'd jog three to five miles a day. One morning jogging, my agent calls about a new series called Barney Miller, saying, "Go there at once." Well, I was tired and exhausted ... I must have run five miles that morning. I said. "I have to go home and take a shower." "No, no, no. Go right now to Studio City, you're very right for it, they know you from The Godfather, they want to see you." Danny Arnold and Ted Flicker, the producers, look at me, I look at them, they look at me again. "You look tired." "Of course I'm tired, I jogged five miles this morning, I'm exhausted." "Yeah, yeah, tell me, you look like you have hemorrhoids." "What are you, a doctor or a producer?" Vigoda starred in a brief spin-off of Barney Miller that centered on his character eponymously titled Fish until it was cancelled in June 1978. Prior to his actual death in January 2016, Vigoda was a constant victim of celebrity death hoaxes. In 1982, People magazine mistakenly referred to Vigoda as dead. At the time, Vigoda, aged 60, was performing in a stage play in Calgary. He took the mistake with good humor, posing for a photograph published in Variety in which he was sitting up in a coffin, holding the erroneous issue of People. Jeff Jarvis, a People employee at the time, said that the magazine's editors were known for "messing up" stories and one of them repeatedly inserted the phrase "the late" in reference to Vigoda, even after a researcher correctly removed it. The erroneous version was what went to print. In 1987, the same mistake was made when a reporter for WWOR, Channel 9 in Secaucus, New Jersey, mistakenly referred to him as the "late Abe Vigoda". She realized and corrected her mistake the next day. He had been the subject of many running gags pertaining to the mistaken reports of his death. In 1997, Vigoda appeared in Good Burger as the character Otis, a restaurant's French fry man. Several jokes were made about his advanced age, including his character Otis saying, "I should've died years ago." That same year, he was shopping at Bloomingdale's in Manhattan when the salesman remarked, "You look like Abe Vigoda. But you can't be Abe Vigoda because he's dead." A Late Night with David Letterman skit showed Letterman trying to summon Vigoda's ghost, but Vigoda walked in and declared, "I'm not dead yet, you pinhead!". At a New York Friars Club roast of Rob Reiner which Vigoda attended, Billy Crystal wisecracked, "I have nothing to say about Abe. I was always taught to speak well of the dead." In May 2001, a website was created with only one purpose: to report whether Vigoda was alive or dead. In addition, in 2005, a "tongue-in-cheek" Firefox extension was released with the sole purpose of telling the browser user Vigoda's status. Continuing with the gag, he appeared frequently to make fun of his status on Late Night with Conan O'Brien, including a guest appearance on the show's final episode. At the 1998 New York Friars Club roast of Drew Carey, with Vigoda in the audience, Jeff Ross joked, "My one regret is that Abe Vigoda isn't alive to see this." He followed that with "Drew, you go to Vegas; what's the over–under on Abe Vigoda?". On January 23, 2009, Vigoda appeared live on The Today Show. He said he was doing well, joked about previous reports of his death and announced he had just completed a voice-over for an H&R Block commercial to air during the Super Bowl. Vigoda and Betty White, both 88 years old at the time, appeared in "Game", a Snickers commercial that debuted during Super Bowl XLIV on February 7, 2010. The synopsis made fun of the advanced age of the actors. The Super Bowl Ad Meter poll respondents rated the ad the highest of any shown during the game. Vigoda and his first wife Sonja Gohlke had one daughter named Carol. The marriage ended in divorce. His second marriage to Beatrice Schy lasted from 1968 until her death in 1992. Vigoda enjoyed playing handball and stated in an interview that he was "almost" a champion at the game in his youth. Vigoda's funeral was held on January 31, 2016. Notable figures including comic Gilbert Gottfried, former New York City mayor David Dinkins, and Friars Club roastmaster general Jeffrey Ross attended. On the 2017 Academy Awards show, Vigoda was not included in the show's memorial reel, surprising many and prompting a small PR backlash. ^ a b Lavietes, Stuart (January 26, 2016). "Abe Vigoda, of 'Godfather' and 'Barney Miller,' dies at 94". The New York Times. Retrieved September 19, 2017. ^ a b c Hamrick, Craig; Jamison, R. J. (2012). Barnabas & Company: The Cast of the TV Classic Dark Shadows. Bloomington, IN: iUniverse. p. 445. ISBN 978-1-4759-1034-6. ^ U.S. Census, April 1, 1930, State of New York, County of Kings, Borough of Brooklyn, enumeration district 566, p. 14-A, family 10. 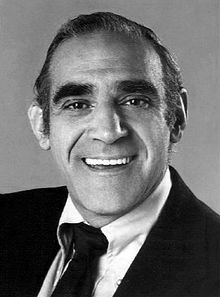 ^ "Abe Vigoda Biography, FilmReference.com; retrieved January 4, 2013. ^ "Gil Kane, Interviewed by Gary Groth, Excerpted from The Comics Journal #186". The Comics Journal. Archived from the original on April 6, 2012. Retrieved January 7, 2014. ^ a b c "Abe Vigoda Biography". A+E Networks. Retrieved February 22, 2013. ^ Marguiles, Lee (April 18, 1976). "Fame Comes Late to "Sad-faced" Vigoda". Youngstown Vindicator. Associated Press. Retrieved September 19, 2017. ^ Schumacher, Michael (1999). Francis Ford Coppola: a filmmaker's life. New York, NY: Crown. p. 164. ISBN 978-0-517-70445-5. ^ The Godfather: Widescreen Collection (DVD). Paramount Pictures. 2004. ^ Sharbutt, Jay (May 26, 1977). "Abe Vigoda Likes the Recognition He's Earned as TV's "Fish"". The Evening News. Newburgh, NY. Associated Press. p. 6C. ^ a b Zorich, Louis (2009). What Have You Done? : The Inside Stories of Auditioning—from the Ridiculous to the Sublime. Milwaukee, WI: Hal Leonard. p. 159. ISBN 978-0-87910-365-1. ^ Bridges, Todd (2010). Killing Willis: From Diff'rent Strokes to the Mean Streets to the Life I Always Wanted. New York, NY: Simon and Schuster. p. 70. ISBN 978-1-4391-5589-9. ^ a b Leopold, Todd (September 23, 2008). "Abe Vigoda is still alive, thank you very much". CNN Entertainment. Retrieved September 19, 2017. ^ a b Silverman, Craig; Jarvis, Jeff (2009). Regret the Error: How Media Mistakes Pollute the Press and Imperil Free Speech. Sterling. pp. 174–75. ISBN 1-4027-6564-9. ^ Brioux, Bill (2007). Truth and rumors: the reality behind TV's most famous myths. The Praeger television collection. Greenwood. pp. 114–15. ISBN 0-275-99247-0. ^ a b c d Italie, Hillel (January 26, 2016). "Abe Vigoda, sunken-eyed character actor, dead at 94". Associated Press. Retrieved September 19, 2017. ^ Rumours of his death are premature The Hollywood Scandal Almanac Page 125 6 February 2016. ^ "Whois Record For AbeVigOda.com". DomainTools. Retrieved September 19, 2017. ^ Ceilán, Cynthia (2007). Thinning the Herd: Tales of the Weirdly Departed. Globe Pequot. p. 210. ISBN 1-59921-219-6. ^ "Vigoda's non-death (he is now 88) is a pop culture meme to this day. Abevigoda.com, for example, does only one thing: indicate whether Abe is alive or dead". New York. 43: 239. 2010. ^ Ross, Jeffrey (2009). I Only Roast the Ones I Love: Busting Balls Without Burning Bridges. Simon and Schuster. pp. 163–64. ISBN 9781439101407. ^ Othmer, James P. (February 8, 2010). "Super Bowl Ads Play It Safe". The Daily Beast. Retrieved September 19, 2017. ^ "Famous Hookups". Retrieved September 19, 2017. ^ "Abe Vigoda Dead". January 27, 2016. Retrieved September 19, 2017. ^ "Abe Vigoda, sunken-eyed 'Godfather', 'Barney Miller' actor, dies at 94". The Washington Post. January 26, 2016. ISSN 0190-8286. ^ Balsamo, Michael (February 1, 2016). "Brooklyn native Abe Vigoda, famed character actor, recalled as a class act". Brooklyn Eage. Retrieved 15 March 2019. ^ David K. Li; Reuven Fenton (January 31, 2016). "Abe Vigoda celebrated with laughs at funeral service". Retrieved September 19, 2017. ^ E.g., Chavez, Danette (January 27, 2016). "Conan pays tribute to Abe Vigoda's many Late Night appearances". The A.V. Club. Retrieved January 27, 2016. "Abe Vigoda the sunken Godfather". The Washington Post. January 26, 2016. ISSN 0190-8286. Obituaries (January 28, 2016). "Abe Vigoda". The Daily Telegraph. Lavietes, Stuart (January 26, 2016). "Abe Vigoda, of 'Godfather' and 'Barney Miller,' dies at 94". New York Times. Marguiles, Lee (April 18, 1976). "Fame Comes Late to "Sad-faced" Vigoda"". Youngstown Vindicator. Associated Press. Wikimedia Commons has media related to Abe Vigoda.